A news reporter delves into the world of a video chat room worker, a high school teen is the target of an online prank, and a couple coping with the loss of their child, fall victim to identity theft. Disconnect is an emotional character study that details how the people in a trio of interconnected stories are influenced by increasing technology. The method in which social media has infected our existence has rarely been scrutinized with such dramatic intensity. 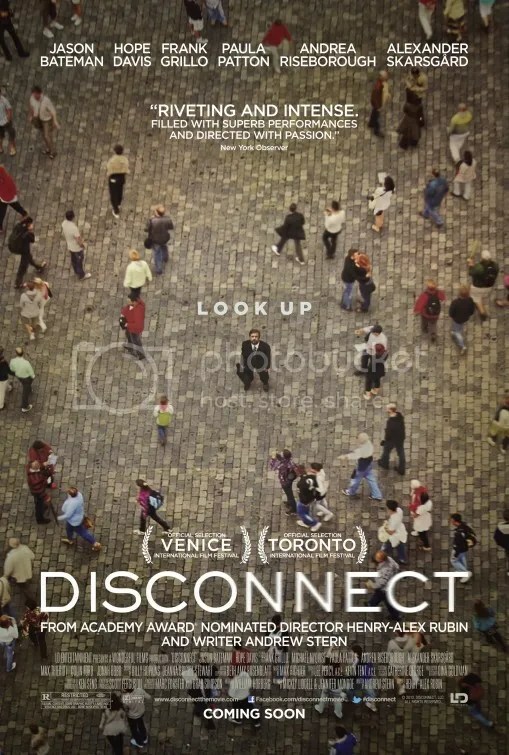 Disconnect examines affinity amongst people, or the lack thereof. These crumbling lives are handled in a similar fashion as films like American Beauty or Paul Haggis’ Crash. The script details their collapse through social media and its influence in the Information Age. Modern technology has so infiltrated our daily routine it has an almost insidious hold over us. The way it affects our close relationships is masterfully exploited. Given the prevalence of Internet chat, digital cameras and smart phones, it’s a topic that I’m surprised isn’t studied more often in film. Perhaps the so called “threat” occupies such a pervasive place in our habits it doesn’t even seem dangerous anymore. What once was science fiction is now reality. That people are able to connect with complete strangers online is a psychological phenomenon that is more pervasive than is ever publicly acknowledged. The girlfriend hoax that involved football player Manti Te’o in the fall of 2012 is one public example. But I suspect there are many more examples of similar occurrences we never hear about. That feeling of closeness with an unknown entity on the other side of a computer is a fascinating subject. It’s an idea ripe for drama and examined in all three of these stories. If this was merely another cautionary tale of the dangers of technology, it might not have been so successful. After all, that concept is nothing new. What makes this account so real is the depth of human sorrow explored. Disconnect does a brilliant job of presenting individuals and their human failings. Loneliness is a pervading theme. There’s a lot of melodrama here and for the most part it presents these people with honesty and believability. In an equation where the sum of the individual vignettes must add up to the power of the overall experience, Disconnect scores very high. There are profound moments of despair. A daughter’s sobbing realization she did nothing to support her younger brother is heartbreaking. A childless couple confronted with each other’s online histories is discomforting. The online conversation between a teen bully and the victim’s father is insightful. That father is ably played by Jason Bateman in a serious turn that showcases a dramatic talent seldom seen in his comedic roles. He’s exceptional but so is everyone else in this reflection of converging lives. There isn’t a false performance in the entire lot. There’s genuine feeling on display. That’s what makes this portrait so effective. British director Danny Boyle’s latest creation is a mind-blowing heist movie in the world of hypnotherapy. Our story concerns a selling agent of fine-art named Simon (James McAvoy) who works at a prestigious auction house just like Sotheby’s but not Sotheby’s. Some thieves led by crime boss Franck (Vincent Cassel) attempt to steal Francisco Goya’s Witches in the Air after being sold for $27 million. Simon, who is actually in cahoots with the criminals, attempts to double cross his cohorts and hide the artwork for himself. But he suffers a blow to the skull in the ensuing fracas. Now he can’t remember what he did with the painting due to his amnesia. Needless to say, Franck is more than a little displeased and forces Simon to visit a hypnotherapist in an effort to jog his memory. 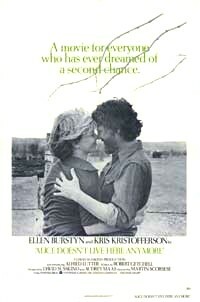 The importance of memory has been a common theme in Boyle’s films. Trance is the latest example. As Elizabeth (Rosario Dawson) probes deeper into Simon’s subconscious, the developing story takes on a depth that becomes more twisty than was initially apparent. The pacing is brisk and the personalities are fascinating. The mood is particularly exhilarating. The style exhibits the joy of a filmmaker that is relaxed. His fun is infectious and I was ready to be taken on an exciting trip. Once again Boyle taps longtime collaborator Rick Smith of the band Underworld for the pulsating score. The music throbs with a life that energizes the plot. All of this lays the groundwork for a head-scratching finale. 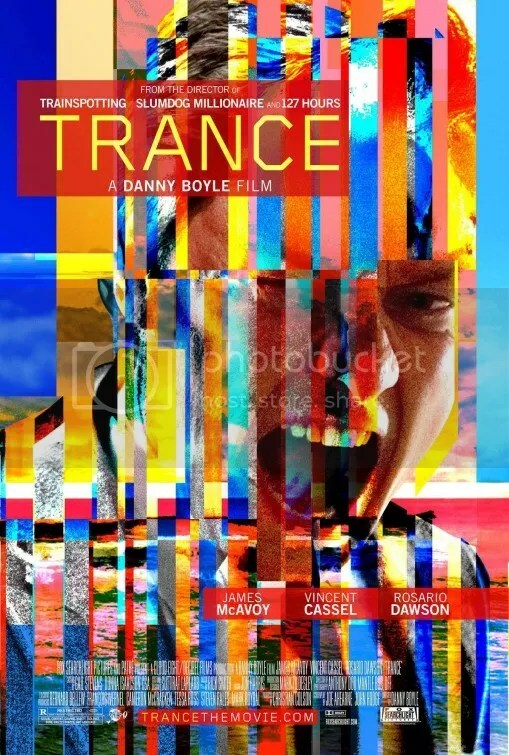 Trance is a well acted thriller. The narrative is surprisingly straightforward for the majority of the drama. It’s not hard to follow. So that makes the developments of the final third a bit troubling. A chaotic eleventh hour action sequence flips everything completely on its head. You‘ll question what you’ve just witnessed. It plays fast and loose with the motivations of the characters. Assumptions are dashed. It tinkers with the conventions of hero and villain. If you’re content to rest in the hands of an auteur and allow yourself to go where he takes you, you should enjoy this film. As a self avowed fan, I was willing to put my faith in the director’s vision. You’ll end up debating the specifics though. Was a particular event real, a dream, a recollection or a suggestion? And who did what and to whom? To be honest, I’m still not sure how to interpret what happened, but for some reason I didn’t care that my expectations were destroyed. I think the journey was sufficiently entertaining that I didn’t mind the misdirection. In fact I kind of enjoyed it. In a future society, Jack Harper is one of the last humans left attempting to mine precious resources that remain on earth. We learn the human race has already been decimated by an apocalyptic war with a group of extraterrestrials called the Scavs. Yet Jack and his communications officer/girlfriend, Victoria (Andrea Riseborough), have no knowledge of this. Their minds erased as part of a mandatory procedure. The unexpected crash landing of a spaceship introduces him to a mysterious woman named Julia (Bond girl Olga Kurylenko), who holds a key to his past. This sets a series of events in motion that will trigger another climatic battle where he may rise up against nefarious forces, so that he might blah blah blah and possibly save mankind. Utterly dull, lifeless story is made mildly palatable by exceptional production design and a glossy facade. There’s a lot to admire. The picture applies a sophisticated and elegant sci-fi style that is a throwback to the cinematic landscape of the 70s. The visuals are classy. There are these nifty little flying machines called drones that look like big metal orbs. These weaponized machines, which protect Jack from alien attacks, utilize inventive special effects and sound. Every time they were on screen I was fascinated by their tangible attributes. Director Joseph Kosinski adapts his own unpublished graphic novel. He was responsible for the visually stunning TRON: Legacy which I enjoyed. Although I’m starting to sense a pattern as that film suffered from a weak script as well. He wisely employs production designer Darren Gilford again and Academy Award winning cinematographer Claudio Miranda who lensed Life of Pi. Also like TRON: Legacy, Oblivion is highlighted by an orchestral score by a French electronic band. This time it’s M83. Their score’s rich sonic texture is often the only thing that maintains attention when nothing of interest is happening. All of the shenanigans dress up the proceedings in a way that superficially masks a dreary screenplay. I really wanted to enjoy this. Works that champion style over substance don’t necessarily preclude my enjoyment. Director Tarsem Singh has built an exquisite oeuvre on the practice. The script’s heart is in the right place as it favors speculative concepts over gadgets and shootouts. Its attempt to be more meditative is admirable. Despite the gorgeous veneer of quality, the soporific story holds absolutely no innovation, passion or enthusiasm. The ideas are thoroughly mundane. Its setup held some promise at first, but it ultimately languishes into something so stridently average. Add to that numerous long, static shots where nothing happens and you have an excellent cure for insomnia. Its narrative similarities to other flicks kept reminding me of better movies I could be watching. I was tempted to list the many examples from which this mediocrity appropriates but that would merely insult a list of superior science fiction movies. 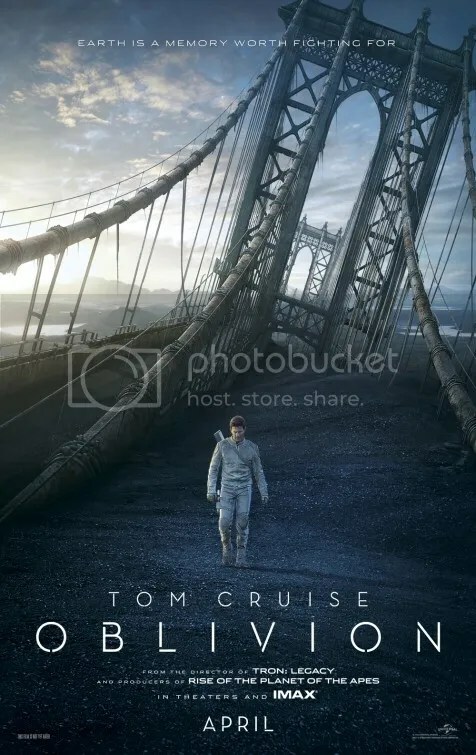 Borrowing from other futuristic films wouldn’t have been enough to discredit Oblivion, but the utter lack of excitement is. The life of Jackie Robinson gets the treatment you’d expect in Warner Brothers’ perfectly serviceable biography. The chronicle is a suitable document of the first African American to play Major League Baseball (MLB) in the modern era. 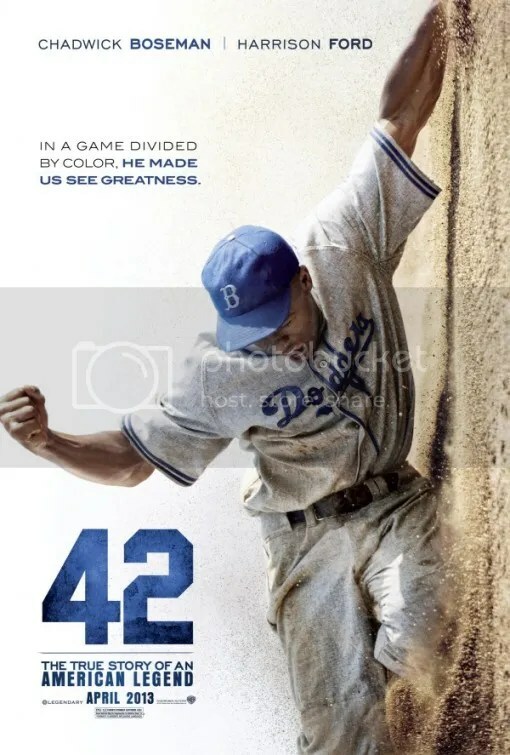 Director Brian Helgeland (Payback, A Knight’s Tale) beatific depiction of Jackie Robinson is befitting of how Disney handles their sports pictures. It’s reverent, didactic and compelling. However given the magnitude of Robinson’s breakthrough, I was expecting a bit more grit. Perhaps in the hands of a more contentious director, the action would have seemed more controversial. There’s a brief moment of that in one particular scene involving actor Alan Tudyk as Ben Chapman, the manager of the Phillies who vociferously opposed Robbins’s presence in MLB on the basis of his race. The scenes in which he taunts Robinson with racial epithets was even more disturbing than the many uses of the N-word in the movie Django Unchained. Perhaps that’s because this is a true story but also because of Robinson’s pacifist approach to the abuse that was forced on him. It’s is one of the few instances where you genuinely get a feel for the weight of his struggle. 42 is a polished biography. It’s got beautiful music, bright cinematography and is populated by some nice performances. Chadwick Boseman notably underplays Jackie Robinson in a way that doesn’t feel like he’s grasping for the Academy Award. He’s quite effective. As is Nicole Beharie who plays “the wife” but with an effervescence that made me want to see more of her in future films. Harrison Ford reminds us that he doesn’t always just phone it in. As Branch Rickey, the General Manager of the Brooklyn Dodgers that signs Robinson to the team, he is truly engaging. 42 hits all the dramatic notes you’d except in a memoir such as this. It’s not particularly deep or insightful, but it is inspiring. Robinson becomes more a symbol through which other people unleash their racial hatred against. I would’ve appreciated a little more detail in the script about the man himself. More vignettes involving his personality as well as his athletic accomplishments in the world of baseball would‘ve been welcome. The lesson appears to be talent and money speak louder than hate. 42 is an admirable addition to baseball pictures that dutifully dramatize the subject in a way that is both pleasant and entertaining. It’s kind of surprising to see a horror film like Evil Dead in 2013. 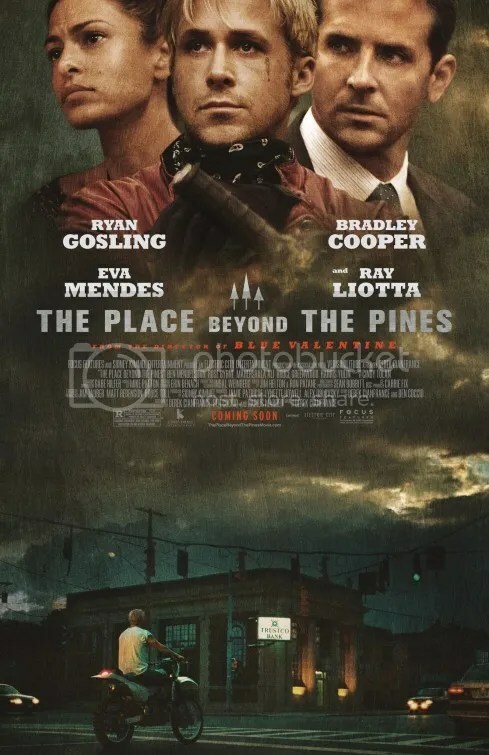 After Wes Craven re-wrote the rules with the self knowing Scream back in 1996 and then The Cabin in the Woods more recently deconstructed the genre further, I thought the attitudes on display here were a thing of the past. Evil Dead is a giant step backward to the naïveté of the 1980s. Here we’re presented another group of kids playing about in the woods. They behave like idiots, existing so they can be dismembered, killed, and gutted in the most gruesome methods possible. It’s gross yes, but it’s certainly not scary. Ok so this is a “remake” of Sam Raimi’s highly regarded cult film that inadvertently became a camp classic. The cartoon violence was over the top and had, let’s face it, special effects that were so bad you had to laugh. C’mon! The blood looked like grape jelly. But this is a remake in name only. Other than the basic underlying story, this is much different. Its “improvement” is that the torture actually looks real. Evil Dead has technically superior gut churning violence but it’s utterly lacking in spirit, charm, humor or scares. The plot is simple. A group of 5 friends meet up in an old abandoned cabin in the woods. Mayhem ensues. Why are these cabins always built in some remote area with only one road in and no human contact for miles? Apparently this is where Mia and David’s mother battled with insanity. And they want to spend more time there? The friends are helping Mia kick her drug addiction. In order to detox and get clean they must keep her there regardless of how much she wants to leave. That’s an inspired rule and the script’s lone bit of intelligence. Despite the fact that the kids are a bunch of morons, I will clarify that their acting is fine. These young adults act appropriately scared. That’s all we require in a product like this. Its unfortunate they serve an inferior story. Haven’t we seen this before? 5 people are terrorized and then behave in ways so stupid, it boggles the mind. Seriously if I felt any modicum of fear it was that I might roll my eyes to death. First the whole gang stumbles upon a secret cellar under the cabin filled with what looks like decaying cat carcasses hanging from the ceiling. They don’t leave. Then Eric, the biggest idiot, finds a book made of skin with barbed wire all around it that says “Do not open” so naturally he proceeds to open it. Then starts reciting spells that should not be spoken. 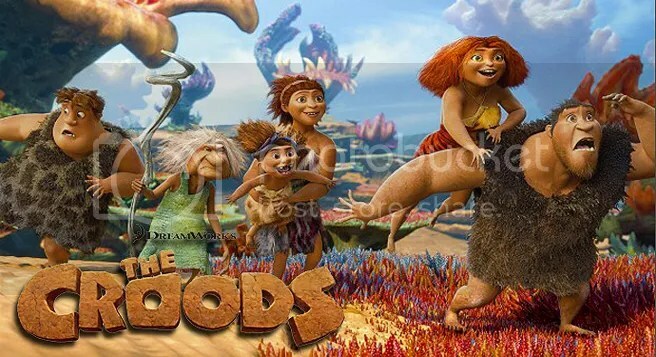 Mia is subsequently attacked by a tree in a scene that is surprisingly tame compared to the original. She gets possessed and then starts killing everyone in sight. At this point we couldn’t care less about these people. I mean they practically asked for it. Projectile vomiting (The Exorcist), a demonic girl curses creatively (The Exorcist again), nail guns, carving knives – the film is a smorgasbord of atrocities served up to an audience jaded by years of blood and guts. They demand the ante be raised and this will satiate their bloodlust. One guy in the theater literally hooted and hollered every time someone was mutilated. Debating the merits of this flick is pointless. Your enjoyment will depend on whether you enjoy watching people cut, disremembered, slashed in the most sadistic ways possible. 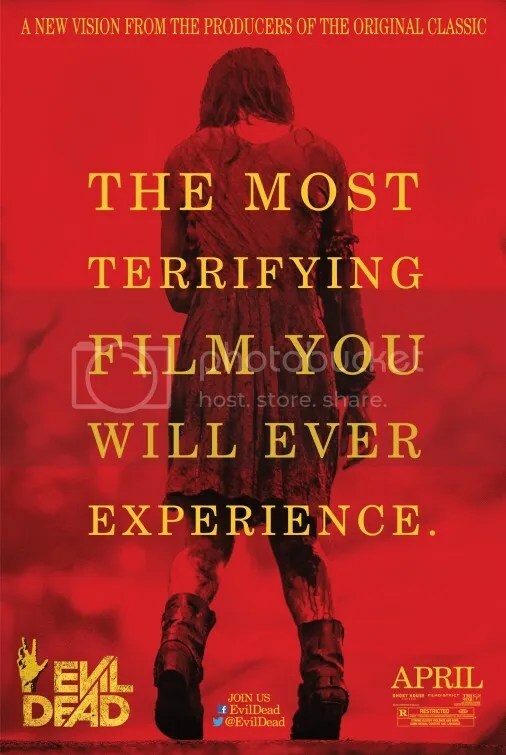 I love scary movies, but this wasn’t frightening in the least. It’s gleefully gross and nothing more.